Update: It appears that after publishing this post, Michael C. Lucas blocked me from his profile on Facebook. This came after he privately sent me another message. I never replied to his first message and did not intend on replying to this recent one. It’s interesting that a group so predisposed to a mythic concept of “honor” would engage in “hit and run” messaging. Yes you read that right; rather than actually answer the question Michael resorts to attacking the legacy of the United States flag (which no one denies.) Of course, I felt obliged to call him out on such things. And wouldn’t you know it, ol’ Michael decided to send me a private message rather than answer me publicly. 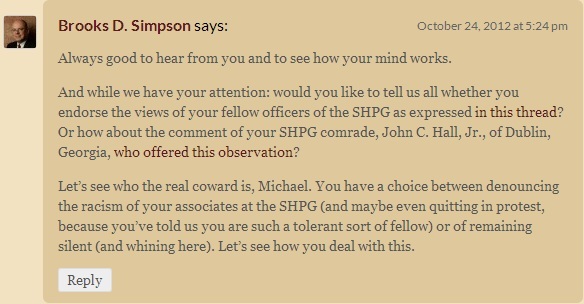 This applies where Brooks asks Michael directly about the recent racist remarks made by the SHPG. Brooks asks Michael to either renounce the comments of his associates or remain silent and whine on Brooks’s blog. Michael gives a blanket statement on his past dealings with racist comments, avoids addressing the situation Brooks is referring to, and then engages in attacks on the U.S. flag as being guilty of racism. It is essentially a textbook definition of tu quoque that Michael does not seem to understand. I fail to see what “perspective” I could have on his ad hominem attacks. Apparently, according to Michael, logic is dictated by perspective. Michael then goes so far as to suggest that I have a Marxist definition/outlook towards history. To those of you that actually study history, you might know it as “historical materialism.” This interpretation looks at history as an evolving struggle between social classes economically based rather than as a series of accidents. Most historians today that adhere to a Marxist Historical method consider themselves more of a marxist historian with a lower case “m.” This is primarily because those historians reject or conflict with the economic principles of Marxism. The primary problem I have with this silly notion that I and others are “Marxist Historians” revolves around students of history being “indoctrinated.” This implies that the majority of historians in the field today that indoctrinate us are also Marxist Historians. This is simply not the case. Currently I am taking a class from a Social historian. I myself am more of a social military historian. The point is, there are numerous types of historiography in which to look back upon the past. For Michael C. Lucas to suggest, in such a colorful way, that I am indoctrinated to the methodology of historical Marxism, shows a crude understanding of the field of history. You realize this is my blog not Brooks Simpson’s correct.? To answer your rant, there are a lot of different historians that adhere to other other types of historiography that attribute the main cause of the war to slavery. Not to mention, Brooks isn’t a Marxist historian. None of his writings/posts reveal that method either. You really need to think things through before writing such lunacy. Thank you for the affirmation of my thesis, that besides “others” that there are and have been those who follow Marx and Engels methods and ideology. You really need to think period, with the long list of ad hominem attacks you make! I didn’t state Brooks was a Marxist historian, I wrote “In my view you are another revisionist following Marxist methods of interpretation of history.” And I even acquitted you of it, because you certainly didn’t come by that on your own, but you certainly adhere to it according to your assertions. Your “affirmation” is inherently flawed and your “thesis” would not hold any weight in peer review. Like I said above, there are numerous historians that adhere to numerous other forms of historiography that arrive at the same assumption. There is no “marx/engles” method simply a marxist method. You couldn’t be more wrong about my supposed “indoctrination,” because I do not look at the Civil War from a working class standpoint. Look up the definition of ad hominem before you wrongly accuse others of it. I do think it is interesting that you are simply repeating insults that have been thrown at you of late. Like I said before, I am more of a social military historian; but if it makes you feel good to categorize the opposition into a sphere where your current political ideology will fuel your hatred, be my guest. 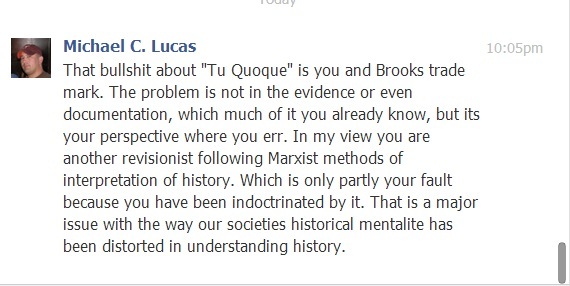 It appears to me that Mr. Lucas is stating his belief, not any definition or form of historiography. It is also apparent that this is all Mr. Lucas requires when judging others or labeling those who disagree with his beliefs. 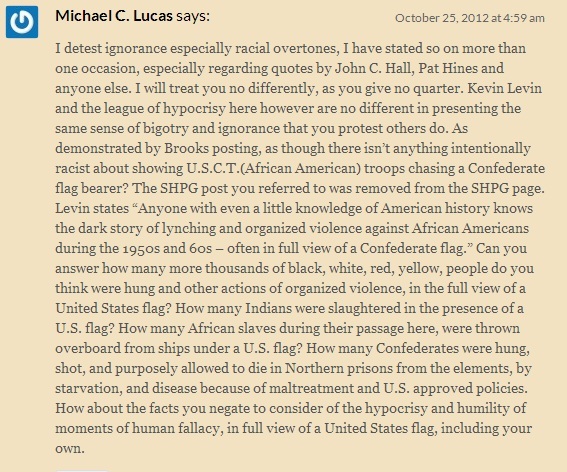 This why Mr. Lucas and the SHPG will fade away from public view. It may take a while, but it will happen. Because simple belief, with no grounding in any type of history, any type of objectivity, will naturally become stale, boring, and repeated, with the same old charges and the same old excuses of why they don’t need anything but their beliefs. It’s like watching a snake’s body squirm and wiggle after it’s head has been chopped off by a garden hoe. Interesting but no longer a danger to anyone or of any real interest. Thanks for commenting Neil. Well said.